As an avid Pixar fan who has seen all of the Pixar films so many times that I have the scripts memorized, I have been waiting, patiently, for Brave for some time now. I have savored every teaser trailer and stared in wonderment at the beautiful Scottish princess with the wild red hair and blue eyes who is determined to change her fate. So, does Brave live up to the hype? For the most part, yes. In my mind, Pixar movies are flawless, where Brave , isn’t. Unfortunately, I think the quality of Pixar’s story lines have really decreased since its acquisition by Disney. ©2012 Disney/Pixar. All Rights Reserved. Brave is the tale of Princess Merida, voiced by Kelly MacDonald, heir to the throne of DunBroch. 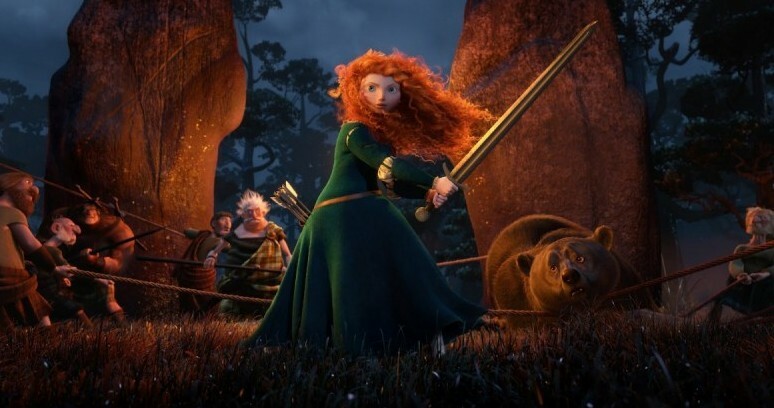 Merida is the daughter of King Fergus, voiced by Billy Connolly, fondly known as the Bear King for his legendary fight with the demon bear Mordu. As a young girl, Merida is given her first bow and arrow, a small gift that she develops into a life long love of archery and adventure. Princess Merida has a trio of brothers, Harris, Hubert, and Hamish; tiny trouble makers not burdened with the requirements of running a kingdom when they grow-up. In an attempt to prepare Merida for her future role as queen, Merida’s mother, Queen Elinor, voiced by Emma Thompson, endlessly schools Merida in proper behavior and etiquette. A lady doesn’t stuff her gob. A lady doesn’t place her weapons on the table. As she grows up, Princess Merida becomes increasingly frustrated with the traditions that she is expected to keep as the first born of a noble family. Traditions she views as archaic. When Princess Merida comes of age, her mother informs her that she is expected to marry one of the first born sons of the three clans in her father’s realm. Princess Merida is infuriated and argues with the Queen that the traditions should change while her mother stands firm that the Princess was born to become Queen and Merida has no choice in the matter. 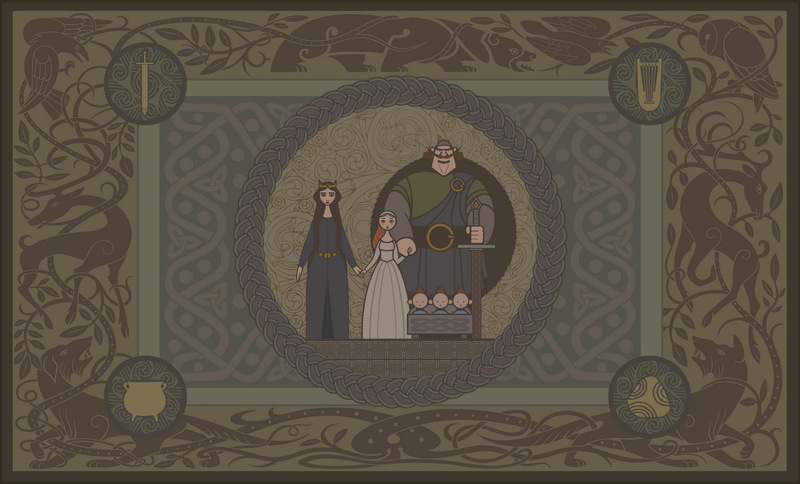 As the three clans of her father’s kingdom come together for a lively highland games, the first born son from each clan is presented for marriage by their respective fathers, the three clan chieftains; massive Lord MacGuffin (voiced by Kevin McKidd), surly Lord Macintosh (voiced by Craig Ferguson) and cantankerous Lord Dingwall (voiced by Robbie Coltrane). Merida learns that it is her choice of highland events that will decide her future husband. Determined to create her own destiny, Princess Merida chooses an archery contest and declares that she will be shooting for her own hand in marriage. Her break with tradition creates an enormous rift in the clans and unleashes chaos in the kingdom. Old witch concept art from Pixar Wiki ©2012 Disney/Pixar. All Rights Reserved. In attempt to gain further support for her fateful plan, Princess Merida consults an eccentric witch (voiced by Julie Walters). The old witch grants Merida an ancient spell, cast only once before, with dire consequences not only for herself but for her family and kingdom. The peril caused by the ill-fated wish, requires all of Princess Merida’s skill and resources, including help from her mischievous brothers, to undo the beastly curse before it becomes permanent. Through the adventure, Princess Merida learns the meaning of true bravery and selflessness. This is Pixar’s 13th animated feature, and the audience was promised technical perfection and Brave delivered. The animation in Brave is perfect. I sat in awe for the entire movie, amazed by scene-after-scene of beauty that brought me right back to my own adventures through Ireland. Pixar’s technical prowess is undeniable; they haven’t neglected a single detail. Merida’s hair looks and moves exactly like real life, the perfection comes with the imperfections that have been meticulously placed throughout Merida’s fiery mane. Above her hair, above the scenery, it was the reality of the facial expressions, especially those of Merida when she cries, that blew me away. 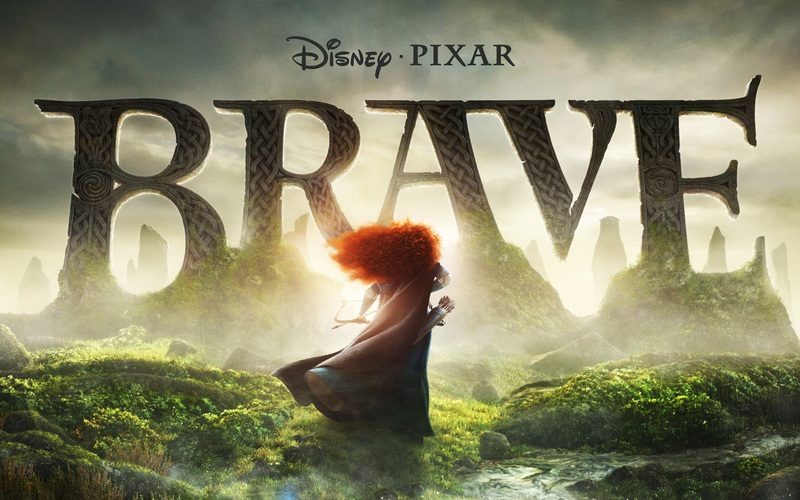 If for no other reason, you must see this movie simply for the technical perfection that is Brave ‘s animation. As someone who never sees 3D movies because they usually give me a headache, I was pretty skeptical about seeing Brave in 3D. I doubted whether I would enjoy having my focus point chosen for me by the movie creators. I’m happy to report that I loved it! I think this may be one of the few instances that 3D actually adds to the movie. The scenery was only enhanced by the depth of field and the specifically 3D special effects were present, but blended with the scene rather then standing out just for the sake of being showy. So, where does Brave fail? I don’t think Pixar mixed well with the Disney princess storyline. I had high expectations for Brave based on the seamless story lines that Pixar has produced in the past. Brave on the other hand seemed like a beautifully simple fairy tale that collaborators tossed more and more unneeded elements onto, just because they thought it would help it appeal to a wider audience. Without spoiling the story, it was those unneeded extras that muddled the plot and distracted me from what could have been an otherwise perfect film. I’m curious to see whether boys are able to relate to Merida the way girls have related to Pixar’s previous male lead characters or if Brave will only fall into the realm of the Disney Princess world that is only marketed to girls. I am disappointed that while watching Brave I found myself mentally begging the writers not to have ruined Merida by making her fit the traditional princess mold. While Merida isn’t the traditional princess, she isn’t the perfect role model for every little girl or boy. I suppose I built up my expectations too high over the last year, and while I love this movie, it left me wanting just something more. I want to mention that Brave has a well deserved PG rating. There are some very scary, albeit brief, moments throughout the movie when the demon bear, Mordu, charges and attacks the main characters. I’ll admit that I am a little hesitant to bring my almost 4-year old to see it even though he is no stranger to violence in movies like Star Wars and shows like Doctor Who . Please consider whether your child can handle these scenes before taking them to the theater with you, while Princess Merida has learned to be brave, your child might not quite be ready. My best suggestion is to sit and watch the Brave trailer below with your child. You will get a good feel for the scariest moments and you can judge your child’s reactions based on that. Just so you know, there is a quick scene at the end of the credits that is funny and worth the wait, so don’t rush out of the theaters too quickly.